Looking for a nice transparent overdrive that is dead quiet and has the most natural breakup you’ve ever heard? Then you better keep looking, because the Mercy Phuk ain’t it. The Mercy Phuk is noisy, nasty, and has gobs of unfriendly output ready to beat the crap out of your amp. Its pissed off that it’s in your pedal chain, and it doesn’t like you… But it is f*%king awesome. 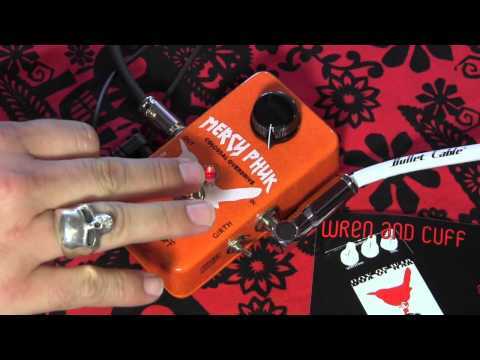 The Wren and Cuff Mercy Phuk answers the many requests we’ve received asking us to fill the gap between our muff-style heavy fuzzers and the slightly dirty grind of our Phat Phuk booster. Sticking with the one knob simplicity of the Phat Phuk, the Mercy Phuk overdrive is designed for the player with a “set it/forget it” mindset and an appreciation of a distinctively voiced overdrive that is touch sensitive and dynamically responsive to the guitar or bass volume knob. Want an aggressive grind with an emphasis on the upper-mids to cut through the mix on guitar and bass? You got it. Want a smoother fatter drive that’s still nasty and lets in all the low-end thunder of your guitar or bass? Flip the “Girth” switch and its right there. The Mercy Phuk employs an op-amp driven MOSFET/LED asymmetrical clipping section with an internal trim-pot that lets the player fine-tune the amount of drive needed to get the tone they desire. Give the knob a turn and both the volume and shape of the distortion change as the op-amp pushes the discrete transistor-driven second gain stage. This second gain stage employs another asymmetrical hybrid germanium/LED clipping section. The result? A mix of old-school germanium diodes to keep things smooth, and modern MOSFET/LED clippers to keep things focused and allow tons of output… In other words, an overdrive that is rich, complex, tight but still unruly. Equally useful for guitar and bass, bassists need not feel like they’re buying half a pedal only useable at one setting. Either “girth” setting will keep your bass tone intact and only change the color of the signal you push through it (sticking with our usual ethic, bassists are never treated as an afterthought). The Mercy Phuk is a minimalist pedal with extraordinary versatility that will be at home on almost any player’s pedal board.